Appearance: Similar to the Troverian cave folk of Harth, Galva is a small statured albeit very broad fellow. Stocky. Buzzed brown hair peppered with many traces of white, a goatee of the same fashion, darker thick calloused skin from working within the depths of the volcanic hollow and Harth in general, green eyes, though rarely seen without his smithing goggles. Pointy nose similar to the other Harth natives. Personality: Gruff demeanor, but friendly once trust has been established. Typically a business oriented individual who finds solace in hard work, and revels in the relaxation earned after getting a job done. Traveling Smithy: Though a long time resident of Harth, Galva tends to traverse the lands in efforts to find new means of smithing. Fascinated not only in the ores and reagents the earth holds, but those found among the beasts of the land. 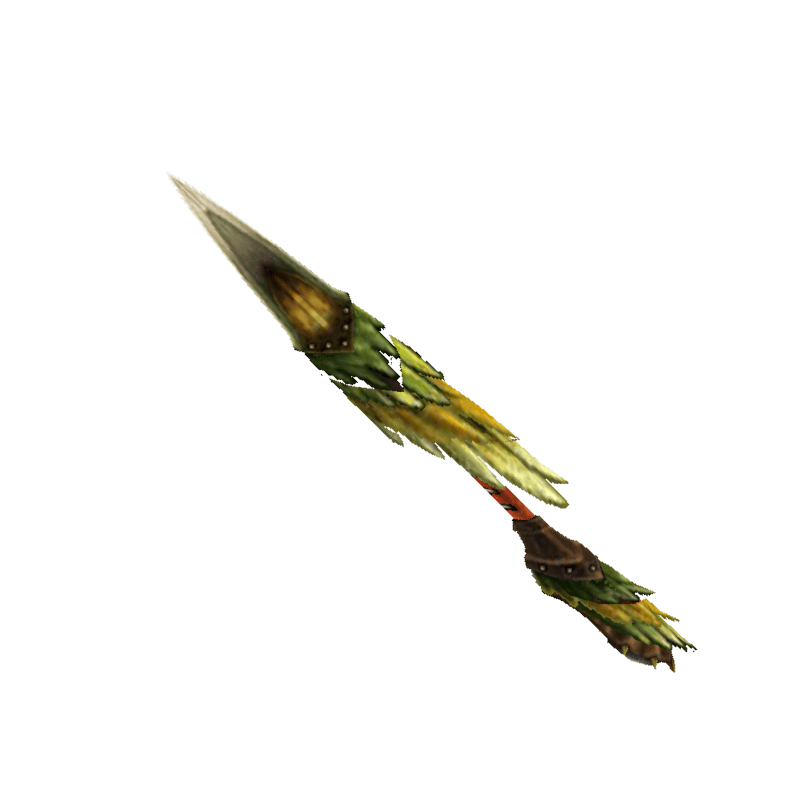 Forager: Galva is a resource intensive hunter, I would imagine his gunlance to be used more akin to a blunderbuss, meaning items procured on the field such as stone, bones, etc could be used as ammo for his gunlance, so long as they were broken down sufficiently. Slinger - Utilitarian gauntlet used as a grappling hook/slingshot. Plays into the forager skill. Portable kiln/billows - Similar to a portable bbq spit, though designed to hold weapons for repair and retooling. Heavy, not likely to be brought on quests. Could be stored at basecamp or airship etc. History: Hailing from the mining village of Harth, Galva developed a knack for hunting after the majority of his comrades fell to a malaise from their supply of fresh molten earth having stopped flowing. Bearing witness to their depressed states, he chose to seek out the culprit causing the blockage of the Troverian's means of livelihood. Having never taken up arms of his own, he took to the depths of the sunken hollow outside of Harth to investigate the cause of the blockage. Following the trail of the latest hunting party, Galva fell “prey” to one of the more commonplace creatures inhabiting the hollow, a small pack of Ioprey and their alpha, an Iodrome. Sporting only basic mining supplies, the Troverian was able to fend off the smaller raptors with his pickaxes, though not before the alpha doused him in it's poison laden saliva. Staggering through the toxicity, the Iodrome took it's chance and lunged at the poisoned cave dweller. Mustering the strength to sidestep its bite, he followed through with a Machalite forged pickaxe directly to the drome's pronounced nasal crest, a sickening crack filling the caverns as he wrenched the axe, as well as the crest free from the drome’s head. As blood and poison spewed from the screeching raptor's head, he finally passed out from the poison’s effect. Overhearing the commotion, the hunting team having slayed the Nerscylla responsible for the lava blockage arrived on scene with the Iodrome, though badly wounded recovering from the blow looming over the unconscious Troverian. Quickly dispatching it, they sent their Palico comrades for help from the surface. Eventually waking from the debacle at the apex base camp of the hollow, the nauseous cave dweller drug himself to the end of the camp's bedding, vomiting profusely. 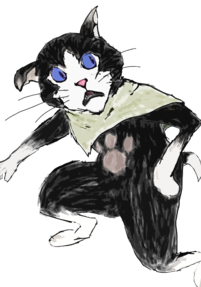 Quickly scampering to his side, a medic felyne provided him with an antidote one of the hunters had left behind for him. Two of Harth's merchants escorted the crestfallen Troverian back to their village. The hunters, impressed by the Troverian’s tenacity sent his belongings back to Harth, as well as the fallen Ioprey and drome materials. Upon returning to Harth, he feared the Chief would admonish him for his behavior, but he was instead met with barrel chested laughter. The Guild and hunters had informed the Harth chief of his exploits and awarded him with the resources to craft a set of armor, as well as access to the hunter’s guild should he so choose to take up the offer, which he gladly accepted. The Harth chief and his head (rust abolisher) smithy fashioned a suit of Ioprey armor for Galva, with a bit of a surprise on the cocking mechanism of the heavy slinger attached to his gauntlet. The remnant of the Iodrome’s crown adorned it, both a reminder of both victory and defeat. More than happy to learn the art of the hunt, Galva accepted and has been at it ever since.
.: Andras Terras - Hunting since '06. Technical weapon expert. :. @Andras: Looks good as well, thanks. @Others: As a little heads up on what other people are planning (just based on what I know). If you want to get dibs on anything, you may want to make a quick note here. Standing at a less than an imposing height of 5'3” her figure is well-proportioned and physically toned with velvety soft pale peach skin shadowed with taut visible muscle, yet still retaining enough corpulence to give her figure a lush hourglass shape. A testiment to her novice skill as a hunter as she lacks the telling scars and hardened visage of most seasoned hunters. Although physically she appears human in stature and form at first glance, her face shadows another lineage in her blood. An innocent rounded countenance framed by a long straight curtain of shimmering dark coral hair with highlights of gold and red threaded through the lengthy tresses that would remind one of a lingering sunset. The bangs parting at her forhead and coming to a tapered point on either side of almond shaped eyes. The color a stark amaranthine purple that hint at the inhuman side of blood. Generally she hides her ears under the thick strands of her hair, however from time to time a delicate point will appear past the strands. Revealing the other half of her bloodline to be that of the wyvarian people. Emotional, curious, adventurous, even tempered, friendly, and cheerful, Chibisa is full of compassion for others and tends to rush into things without really thinking them through. While she can be a bit chatty at times, she is also quick to listen and learn from those around her. Humor tends to be her go-to when she is stressed or finds herself in situations that are uncomfortable. Attempting to ease the tension of a situation if possible when other methods fall short. Though she may come across as naieve and ignorant of the world around her, she is by no means a pushover. Her resolve and determination are evident when given a task or training with her weapons. Armament Tinkerer (Novice): Chibisa enjoys tinkering with weapons and trying to either improve or alter them to better suit her needs. Her pride so far is her Change Glaive. A modified version of the Insect Glaive that she managed to construct a detachment mechanism at the center in order for the glaive to change into twin long daggers. Giving her the ability to shift fighting styles on a whim. Health Drinks/Potions (Novice): Before deciding to become a hunter, Chibisa spent several years with the village healer to learn the ways of preparing herbs and medicinal ingredients into elixirs and potions that would revitalize the body and enhance the mind. Many of these were mixed into the health drinks served at the Yukumo Village hot spring for the benefits of the guests. Yukumo Kasa: Headgear from the Yukumo region. It identifies the wearer as a traveling hunter. Yukumo Dogi: Chest armor common among the people of the Yukumo region, it stresses mobility over Defense. Yukumo Kote: Armguards from the Yukumo region. Worn by rangers, hunters, and travelers. Yukumo Obi: Functional waist armor designed for convenience. Often wrapped around the shoulders for warmth. Yukumo Hakama: Leg armor worn all over the Yukumo region. One can alter the hem width using the sash. Change Glaive: A weapon augmented by Chibisa to resemble those of the Insect Glaives, however without the insect. Sturdy and slim, the weapon as two elongated blades at either end of the bamboo staff. 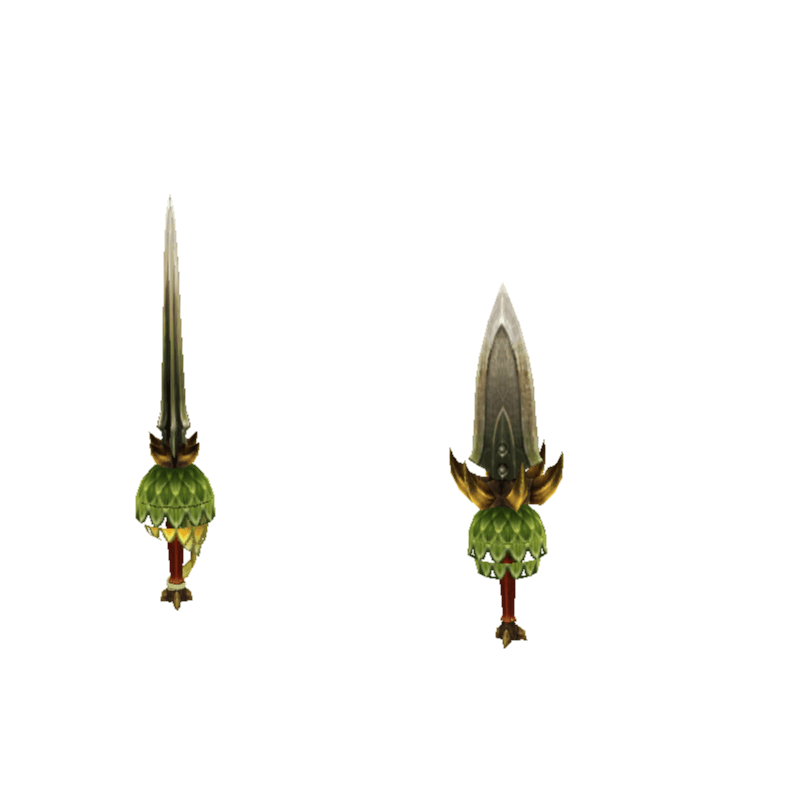 At the center there is a small 'switch' which allows the staff to break in half and become elongated twin daggers. Twin Daggers: Daggers created when the Change Glaive is separated. Large Foraging Knife: Small sharp weapon used to forage herbs and other various ingredients from the surrounding landscapes. Chibisa was brought to Yukumo Village by a passing merchant caravan who had found the wreckage of her family's farming cart while passing through the Misty Peaks. From what could be determined both parents had been killed by a Jaggi pack who had happened upon the unlucky family while traveling to the village. She was given to the Yukumo Chief who happily took the infant girl into her care. Chibisa's early years were fairly uneventful. The Yukumo Chief taught her many things and had been grooming her originally to oversee the village whenever the Chief would be absent. She volunteered at the hot springs often. Learning to mix the health drinks from the hot spring workers as well as the meals that the felynes would prepare for the guests that filtered into the village from time to time. As the popularity of the village began to grow, so too did the variety of people who would seek it out. She began to converse and meet with many of the hunters that would come to the springs to revitalize and recover from various hunts within the vast landscapes around the village. The stories and tales she would hear constantly fed her curiosity and restlessness to see more beyond the village and small wooded areas surrounding it. However, fearing for her safety, the Chief would refuse to allow the girl to train as a hunter. Instead trying to put the girl's focus into the spring and village. That all changed when Chibisa was twelve. During a routine gathering in the woods, she became distracted by strange footprints at the edge of the field. Curiosity getting the better of her she followed the prints and became lost within the thick darkness of the forest. As daylight faded and even the pale light of the full moon barely illuminated the gloomy shadow of the forest floor she sought shelter within a cavern. Yet she soon discovered her mistake as she stumbled upon a sleeping Arzuros. Attempting to back out of the cave without waking the bear, she stumbled on a loose rock and sent it clattering down the stone floor and bouncing off the nose of the creature. With a gruff roar the beast began to stir and push its massive body up from the slumber it had been in. Turning glowing angry yellow eyes on the now terrified girl. Involuntarily she screamed and began to run, fleeing blindly into the dark woods in hopes she would be able to outrun the Arzuros. She had barely broken through the trees into an open field when the horrendous sound of the massive beast barreling through the underbrush behind her reached her ears. She could feel the ground shaking under her feet as she ran. Straining every muscle she could to try to clear the field and make it to the wood beyond in hopes she could lose the creature in the forest. Yet as the rumbling became louder and the heavy breath of the creature reverberated in her ears, she knew she wouldn't be able to make it. The creature's heavy hot breath brushing against her back as it prepared to knock her down. To this day she is not sure if it was pure instinct, or if she had simply stumbled, but she fell to the ground and curled into a ball just as the bear's massive paw swiped above her head. Just as she was attempting to roll out of the way she felt a hard warm pressure on either side of her body and the ground wrenched away from her as she was lifted into the air. The Arzuros repeatedly and violently shaking her small form up and down. She felt the contents of her pack come loose and scatter over the grass below, the last item being a half broken honey comb she had found earlier. The sweet scent filled the air and caught the Arzuros attention, tossing Chibisa aside like a rag doll as the creature descended upon the sticky treat. Chibisa felt her body hit the ground hard, instinctively curling up as she rolled to a stop that had her splayed on her back staring up dizzily at the stars above. Exhausted and gasping for breath she tried to push herself to get back up, but her weakened limbs refused to obey. She heard the bear finish the honey and the familiar rumble of the ground as it began to stalk toward her once more. It would soon be upon her and everything would be over in a matter of moments. She closed her eyes, waiting for the inevitable when the beast roared. It shocked her enough to make her eyes open and she saw from her vantage point a dark clad figure standing between her and the beast. Moonlight shone on her savior's physique. Darkness shadowing the more detailed features of their face. Though what drew her attention was the weapon. A shimmering long-blade of glowing white with dark lettering that spanned the flat of the blade. As the figure slashed at the bear the sword left a blazing trail in it's wake, seeming as if the figure were using light itself to push back the enraged bear. The beast backed from the blade and dodged, lashing out with a wide swipe of its paw when it saw an opportunity. Chibisa tried to sit up, but her exhausted body was finally giving out and darkness consumed her. When she awoke she was back in her bed, a concerned Chief beside her half asleep. Making a small noise, the Yukumo Chief jolted awake and the relief on her face made Chibisa feel even more guilty. She could see the dark circles under the older woman's eyes. Chibisa learned she had been asleep for almost two days and that she was brought back into the village by an unknown hunter who vanished after Chibisa had been taken to the infirmary. She inquired to other villagers and hunters about the person who had saved her life that night, but no one seemed to know who he was. Though she was disappointed she couldn't thank the hunter that saved her, she found her motivation to become one. The Yukumo Chief hesitantly agreed, rationalizing that to prevent the incident from happening again it would be in the girl's best interest to train. For the next 8 years Chibisa trained diligently. Learning all she could from the local and passing hunters. She found a connection with weapons and an affinity with the Glaive and Twin Swords. She began to experiment with different weapons and eventually designed a weapon of her own. Combining the Glaive with the duel daggers to create what she called the 'Change Glaive'. On her twentieth birthday she was given the traditional Yukumo Armor and invited to register with the Hunter's Guild after successfully completing her training. Because everything is better with googly eyes! Gaige has a more slender build, with lean muscles; his hair is shoulder length and brown, typically worn in a warrior’s tail when entering battle. Generally bears a quiet, kind, yet reserved demeanor, but can become quite fearsome in battle. Has eyes the color of the forest. Gaige is, to a fault, kind and polite, even if he is more reserved. He’s always willing to help, and if someone’s injured, he always does his best to patch them up the best he can with his herbs. He hunts both to support his mother, and to carry on his father’s legacy. He can be quite resourceful, and is very protective of his Kinsect, with whom he shares a deep bond. Gaige is fascinated both by insects and plants, and always enjoys making medicine and experimenting with various herbs and mushrooms. He doesn’t care much for those who disregard nature, and it’s rare to see him open up to others. He’s also a vegetarian, but more from a love of vegetables, rather than a dislike of meat. Herbalist - Being the son of an apothecary, Gaige grew up learning about various plants and mushrooms, along with their medicinal and poisonous properties. He’s skilled at mixing together herbs and mushrooms to make both medicine and poison, and is just as skilled at applying both. Kinsect Bond - Having nurtured Alca the Kinsect since he was twelve, the two have developed a deep and instinctual bond, allowing the two to act as one, with little need for communication. Gaige currently wears Kecha armor, adorned a pouch on the left hip that houses various herbs, along with another, smaller pouch that has a mortar and pestle for mixing them. In addition, he has two more pouches, one on each thigh. In the right pouch are some pre-prepared medicinal concoctions, such as Potions, crafted as pellets about the size of a marble. In the left are some pre-prepared poisons in various formats. Dual Piercers (Maccao Duals) Sheathed on his lower back. Fader Rod (Maccao Glaive) Sheathed across his back. A Slinger-like pheromone launcher on his right arm, used to quickly direct Alca from place to place in the heat of battle. Gaige’s mother is a traveling apothecary, and his father a renowned hunter. The two met when his mother found his father wounded while she was gathering herbs; after she patched him up, he was ready to get right back into the thick of things, but she warned him against it so his wounds could properly heal. Both stubborn in their own right, his mother ended up tagging along with his father until his wounds fully healed. They ended up falling in love down the line, and after stopping in a town for a few months while Gaige was born, they continued traveling from town to town. His mother being an apothecary, Gaige grew up around various plants and mushrooms, and grew a natural interest in them. So, from a young age, he grew up learning everything his mother knew, and picked up on everything quite well. Additionally, his father being a hunter, he also learned how to defend himself as soon as he was old enough to hold a weapon, and his desire to protect his mother while his father was away led to him learning how to fight and hunt monsters as soon as he was able. Always traveling from town to town with his parents, Gaige never had any friends, and decided it’d be futile to even try, so he devoted all of his time and effort towards learning both his parent’s trades. By the time he had turned twelve, his father had given him his first weapon; the Maccao Dual Blades. With them, Gaige could now truly protect his mother while they gathered herbs. Around that time, he found a wounded Alucanid in a nearby forest. He brought it back to his mother, and she used her knowledge of herbs to patch it back up. Gaige looked after and took care of it while it healed, and the two became inseparable. The Kinsect, which he named Alca, was his first, and only, real friend, and the love and care he shows it is proof of that. The two made quite a remarkable pair; they worked extremely well together, in almost everything. His Kinsect made collecting hard to reach plants a breeze, and when fending off smaller monsters, the two fought in complete synchronization. When he was fifteen, the two of them worked together to slay their first large monster when a Great Maccao attacked him and his mother while they were gathering herbs. He asked his father to take the parts to a blacksmith to make an insect glaive, so he’d always be able to remember his first kill. A few years later, his father died fighting a fearsome monster. They told him it was an elder dragon, a Kushala Daora, and that he died inflicting a grievous wound that made it flee. Wracked with grief, Gaige fled into a forest with Alca to be alone for a while. It was then that he had a nasty run-in with a Yian Kut-Ku. He tried to fight it, but quickly learned just how weak he truly was. He had nearly lost Alca when the forest had caught on fire, and they were forced to flee. After that, Gaige became a hunter, vowing to carry on his father’s legacy and become strong enough to protect Alca. Even though he learns quickly and grows in skill everyday, in the three years he’s been a hunter, Gaige has climbed very little in the ranks. Shunned by most for keeping largely to himself and his Kinsect, not many want to hunt with him. Despite that, he’s still determined to carry on his father’s legacy and prove he’s just as skilled a hunter as his father before him, and so he regularly takes on hunts by himself. But he knows that won’t last forever; there’s only so much one person can do on their own. @Chibisa: As said, looks good. @Blaster: Looks good as well. I'd prefer to keep it to one set unless there's a BIG reason for it... In this case though, they seem pretty similar, Lagombi just being warmer. Also, what relative weight did you intend? I'd probably peg both as lightweight, but an argument could be made for medium (maybe lined with chain mail). @Others: Considering Coyote is a medic, Chibisa is a potion maker, and Blaster is an herbalist, I would encourage others to steer away from the healing and herb profession. Katamar: Meylnx, scout type, trapper? Jus: Big man, carpenter, woodsman, architect? Sayrdon is a large man with broad shoulders and stocky limbs that make him seem more akin to Ox than man. Brushed copper hair sprouts in a mess atop his head, creeping downward and connecting to a full unkempt beard. Dull blue eyes peek out from just below the matted nest of hair, indicating that he doesn't have much use for primping and posturing. Like the land he chooses to work, Sayrdon can be seen as uncaring, cold, and stoic. This, however, is fairly accurate. He does not operate well in large crowds, nor is he what you'd call a "people person." Gruff, yet mild-tempered, he's happier plodding away his days attempting to find the most sustainable crops to grow or felling trees. If anything, he views hunting only as a way to fund his simple passions. Woodworker - Years of living off the land and vying for survival have led Sayrdon to become proficient in lumberjacking and carpentry. Though no master, he can hold his own when it comes to furnishing and crafting simple to moderate designs. Homesteader - A preference for simplicity and no-frills have led to a "survive-by-the-land" mentality, where Sayrdon attempts to provide completely for himself. This includes rudimentary agriculture, small-game hunting, and provisioning. Mafumofu crafted with Congalala parts as the main material. Some have remarked he looks like a Pink yeti. A wood cutting axe sheathed at the right side of his waist. A carry-sack housing shells (RP equivalent of Normal 2, total 30) hangs against his left side. 50 feet of moderate-thickness utility rope rest across his body like a sash. Having been born in a bustling district of Minegarde and unable to cope with the noise-induced headaches, Sayrdon up and walked away from it all when he came of age. He traveled the lands, settling for a few months to years, leaving behind the meager homesteads and shacks when he got the urge. He rationalized this as "Waypoints for Wanderers", to assuage any internal conflict of abruptly leaving the shacks he created along the way. After tiring of dry climates, Sayrdon decided that he'd begin a journey to a more humid location. A jungle or bay, perhaps. He believed settling near an ocean front would provide enough resource to live comfortably off the land. Unfortunately his dreams would have to wait, for just as he was about to leave on simple hunt, he was greeted by a frantic Guild Messenger instructing him to the report the Airship immediately. I'll keep the Kecha armor. I already edited out the Lagombi. As for weight, I was looking at going for Lightweight, for maximum mobility. Also, I wanted to ask, on the herb and mushroom mixing, what kind of effects would you allow? Something like making a Hot Drink, or an insulating lotion that warms the skin, for example? Okay, I'm ready to submit my character. I have been mulling this over, but I decided it would be fun to try a character that behaves much differently from the ones I have typically made in the past. This should be good fun. Thandraug is a towering, well-built brute of a man standing tall and with a dominating presence about him. He is ever so lightly tan-skinned, wears his dark umber hair at a short, practical length and possesses a fierce hazel-eyed gaze. He is dressed with basic, modest hunters' attire which grant a view of scars which can be found in many places on limbs and around his torso. Some were recognizably monster-inflicted, while others looked to be injuries he may have gotten in fist fights or personally inflicted in training. To him, they are simply trophies, regardless of their cause. Thandraug is an intense person by nature who possesses an indomitable spirit. He believes in facing challenges head-on and is not afraid to let his confidence show. He is loud and blunt about anything he says and speaks with pride, but is never arrogant. He may talk a big game, but his personally philosophy is that one who talks big should act bigger. He knows he is not indestructible and is prepared to escape from a threat that he knows he cannot face, but will let nothing prevent him from tackling a difficult task that is not foolishly, unreasonably beyond him. He has a genuine distaste for people who devalue the effort that goes into facing foes great or small. Thandraug values first impressions and is quickly quite trusting of people who make the right impression. He enjoys people and believes that hard work and intense revelry are equally integral parts of the human experience and will not pass up the opportunity to enjoy another's company. Generally, Thandraug is unconcerned about social boundaries and will treat anyone whom he views favorably as though they are a childhood friend, but is always genuine and wears his heart on his sleeve. What Thandraug lacks in technical prowess he makes up for with spirit. His lifeline is his ability to face any sort of foe without so much as a shred of hesitation or fright. (He has a stronger resistance to being startled, losing balance, wind pressure, and intense sound). Thandraug Almagest is a man driven with a burning passion to be the best at what he does. Thandraug was raised in a lively village by the name of Ghel Agiri proximal to Dundorma and the Jio Telado Marsh. Thanks to great strides in reconstruction on the part of the Hunter’s Guild, Dundorma’s boom led hunters, merchants, and researchers to settle in the region and traffic the nearby villages as well. The modest village became moderately well off due to the patronage of wealthy individuals and saw an increase in sporting events on a larger scale within the region. As a child, Thandraug’s motivations manifested themselves at an early age through his efforts to outperform his peers in sports and feats of strength. He held great pride for his village and sought to help put Ghel Agiri on the map. While, at first, Thandraug struggled to discern the right occupation for drawing more admiration and respect for his village, but, in his later teenage years, he gravitated toward combat sports. Upon reaching the age of 18 he had helped define a new style of fisticuffs titled Agiran Boxing. The sport became a popular pastime which saw never levels of traffic in the flourishing village, even raising funding to construct a colosseum of sorts in which matches were fought with higher stakes and intensity. Hardened fighters from across the region and a few from farther to the west came to participate and to observe in Ghel Agiri’s pride and joy, but many were not long lasting fixtures of the sport. Thandraug, on the other hand, was a truly dedicated fighter that held his own over the course of this energetic time. He earned both glorious victories and tough, nail-biting learning experiences. His renown was not earned for a number of victories, though he certainly won his fair share of bouts, but rather for his tenacity. Thandraug knew how to fight, but more importantly, he knew how to endure. Some of his most memorable bouts were those he had lost, experiences that saw him facing off against hardened men in their prime. Sometimes he even came face to face with local acclaimed monster hunters that had practiced the sport during deployment to the area. The important thing about his fights were that, despite facing incredible odds, he never went down quickly. He was just a young man, still full of piss and vinegar, and yet few rookies looked forward to facing him in the ring too early in their careers because they knew that they’d have to stop barely short of collapsing a building on the man to make him yield. After five years of fulfilling, daring experiences, Thandraug was happy to find he had truly made something of himself with his own two hands. All of his hard work had taken a steep and sudden decline at that time, however, when terrifying beast classified as an Elder Dragon tore through the region including Ghel Agiri. Hunters had been dispatched, and the latest of Dundorma’s technological wonders utilized to repel the beast, but not before it had left deep scars on the village’s livelihood. While injuries were to be expected, miraculously, no Ghel Agiran dwellers had lost their lives in the attack; the Hunters Guild acted quickly to call for an evacuation. The cost of this tragic event, rather, was an entire subsection of homes, a large chunk of the marketplace, and the utter removal of the colosseum from the face of the village. Rebuilding would inevitably fix the problems of shelter and economic stability, but the pride of Ghel Agiri had been gravely wounded. While the village was still well respected for its history of exceptional sporting events and boxing fanaticism, fear gripped outsiders and dissuaded them from frequenting and continuing to patronize non-militant village that had been in the path of a mighty elder dragon. Agiran Boxing continued and the village managed, but it had since struggled to make a dent on the world map like it had before. Thandraug, in all of this, had found himself at an impasse. He wanted to see his village improve, but he also desired to face the reality that spectator sports would no longer see his proud home rise to the promanance that he had always dreamed it would. Truthfully, he also desired to tackle a greater challenge and stand up to greater foes. He had become embittered by the fact that he was part of an evacuation caravan instead of being one of the individuals who stood up to threat that his home faced. The year of Thandraug’s 23rd birthday was given to training and enlisting in the Hunter’s Guild’s Dundorma chapter. His experience had toughened him up for a beginner, but the experience of hitting a man with your bare fists to knock him out was drastically different from that of battling tooth and nail for survival against fanged, clawed, tailed beasts that sought to draw blood. He gave four years of his time to hunting for Dundorma, developing his skill with weapons, continuing to keep his Agiran Boxing skills sharp, and developing survival instincts that would aid him in rough climates against the heavily varied and instinct-based combat that defines hunting. He had finally proven himself worthy to represent the Guild beyond the confines of Dundorma’s offices when he led an expedition to take down a rampaging Basarios in the Jio Telado Swamp, a daring hunt whose carcass was offered to him as a gift by the expeditionary force in thanks for his dedication and self-sacrifice. Adopting the self-proclaimed title of ‘Rocksteady Almagest’ Thandraug set out to offer his services to the Hunter’s Guild on a wider scale, hoping to bring himself in contact with bigger and tougher game while at the same time being a testament to the sporting village of Ghel Agiri. He may yet remain to be a young, up and coming hunter, but Thandraug passionately hopes to someday show himself to the world. A meager, fun-loving village like his own will be a shining example of toughness and endurance in the face of impossible odds, and he will shout these virtues to the gods and elder dragons of the land themselves until the whole world knows it to be true. Every story needs a character to play the role of the straight-man. I figure it's time I try it. Hunched over, with black fur. One ear won't stand straight. Myar has stopped licking himself in order to better assimilate with human society, as such his fur is overlong and shaggy. Myar is constantly losing battles with felvine cravings, and bounces radically from hyper-vigilant and nervous to manic and playful. His struggle to keep his kleptomania at bay is MOSTLY a winning one, thanks to the help of a good mentor. Having been a bandit and a thief, Myar is very sneaky. Myar also maintains an affinity for trap making, especially when involving explosives. Myar doesn't enjoy the weight and clumsiness of armor, and instead keeps a meshed cloak for camouflage. Cat A. Myar lived most of his life as a bandit, robbing hunters in the forest. One of his marks always caught him in the act, but would come through frequently. The two made a game of seeing if they could outsmart each other and eventually became friends. The hunter helped Myar integrate with human society (keeping his sticky fingers in check), and Myar helped him as a Palico. When the hunter never came home from a hunt (one that Myar should have been on), Myar set out looking for him. This meant taking on hunts by himself, especially ones that demanded travel. Myar is certain that his friend is out there, and he'll do anything to find the hunter. @Jus: Looks good, thanks for editing. @katamar: Looks good, thanks for editing. @Kuriyan: We already talked about edits. @Blaster: Thanks for making the change. Regarding herbs, mushrooms and so on... Either of those ideas should be fine. Toxins and irritants are another possibility. We can leave it broad and play it by ear. @Everyone: If we’re lucky, I might get this started this weekend… I have a feeling not though, might be busy IRL (people will be bingeing World anyway). For future reference, little OOC comments and questions in the game thread are fine, but for more drawn out discussion here (or PM) would probably be better. As a heads up, I'll probably wait another ~week to post and get things moving. Figure most people are busy with the release of MHW. Feel free to keep socializing and all that. Alright, with the first “quest” nearing its end I figure now is a good time to review (without pausing the actual game). Was there anything you didn’t like or think should be adjusted? Anything you liked and would like to see more of? The first fight (giaprey) was deliberately easier to get the hang of things. With the Blangonga (and blangos) though, I think it started a little too easy. The hunters would try to do something, and it would mostly go as planned, generally without the hunters taking any hits. You might have noticed towards the end I started running over plans and dealing out more damage (even though the Blangonga should have probably been less dangerous as it took more injuries). It can be tough to strike a good balance, since you don’t want to just completely shut down anything the players attempt, but everything going as planned can get boring. Want to deal some damage too, but not totally take someone out of commission. Unless there’s wide disagreement though, I’ll probably try to keep the heat up. I gotta start figuring out “what next.” I have a feeling there’s going to be like a big meeting/briefing to start, then a running list of concurrent objectives. Any of the objectives might have a large monster interfering with it. If you guys have any ideas, big or small, feel free to let me know (here or PM). There has been consideration about moving this whole game to another website (rpol.net). Part of this is just to pull in some more people, since we lost about half the crew and I don’t see any more people jumping in. But yeah, I figured I should get some feedback. If you're going to extend this, we could use some more things to do. Naturally, I wouldn't have us do everything, but that would work out entirely with how the village briefing goes. If possible, have our characters in the briefing as well, so we know what needs to be done (except maybe the newbies that join, but that's your decision). We may even decide on our own what needs to be done first. I have no complaints with the move to the new site, just as long as everyone knows what's going on.